BILBELLE: What have I got in my pockets? BILBELLE: Yes, but what is inside? GOLLUMME: We wants the pocketses! GIVE US THE POCKETSES! GOLLUMME: WE WILL SKIN IT AND TAKE ITS POCKETSES! BILBELLE: I mean they’re attached to my pants. I can give you my waistcoat. 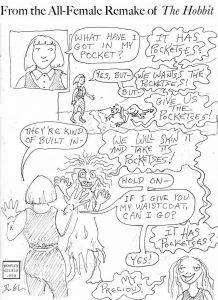 BILBELLE: Yes, it has pocketses. Um, I mean pockets.